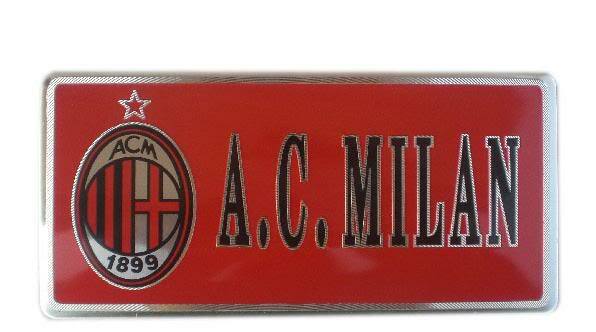 One of the most exciting accessories that I personally like to have as a die hard Ac Milan fans is getting a Milan themed car number plates or licensed plates for my car. Just like many other people who like to have a personalized plates for their car, for a Milanisti surely getting a special Rossoneri themed car plate for my ride would bring total excitement and prestige among other fans. It's a bit old, however here are some of Ac Milan highlights from the latest Trofeo TIM tournament last Friday, which was one by Inter. Being a fan of prestigious soccer club such as Ac Milan, or any other major clubs always brings you the enthusiasm to show how much of supporters are you to other football maniacs. One of the best way of expressing the love for our favorite clubs aside from watching their games is by purchasing accessories of the team we support, in this case surely the Rossoneri. Despite still being considered as an old squad by many people, Ac Milan actually preparing a serious future project that currently being outlook by many football viewers. For at least the past two seasons, the Rossoneri have been making serious signings in the youth squad by acquiring some very interesting youngsters and placed them into the Rossoneri's youth ranks.